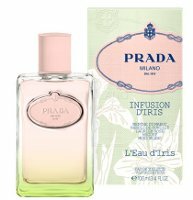 Prada has launched Infusion d'Iris L'Eau d'Iris, a new limited edition version of 2007's Infusion d'Iris. Infusion d'Iris L'Eau d'Iris was developed by perfumer Daniela Andrier; the notes feature iris, neroli, Moroccan mint, lily of the valley, orange blossom, pink laurel, vanilla, woods and white musk. Prada Infusion d'Iris L'Eau d'Iris is available in 100 ml Eau de Toilette. I admit I am only a tiny bit curious….I did really like the Absolue, but only need so many variations on this theme. I do take it that it means the “Infusion series” thing is over. An infusion of water of iris? Can water be be an infusion? I used to wear the original to parent/teacher conferences to ward off complaints about my younger son’s impish defiance of authority. Sounds like a version one would wear to the earliest years’ conferences. What Pradaholic’s got to to! I wanna try! The absolue did not make it all the way to South Africa, but I did try it at the airport in Cairo on an extremely rare excursion to another country. I assume we will not be seeing this one! I didn’t like the absolue that much, though I adore the original EDP, so I am not too peeved about it. I love the original and the Absolue – I own both and wear them on a regular basis – so I’ll definitely try this when I come across it, but I’m not particularly optimistic. Maybe if the Moroccan mint is featured? I’m into mint lately. Honestly I think the fact that the juice is pink is making me extra cynical about this one. Oh I do hope that Prada will resist the temptation to flanker the original to death – it is a splendid and genuinely seminal scent, but do we (Lucas excepted) really need 100 versions? This sounds and looks lovely, but I can’t help but feel a little disappointed that they’ve sold out by doing a “l’eau” flanker to an already light fragrance. Just smelled (and wore) this today and have to say this is quite good! If you enjoy the mint-rose thing it’s so pretty. It’s overalls very soft like the original. You can definitely smell the mint and laurel. The rose only becomes apparent once the mint fades. Its different. I want a bottle. And I didn’t see the notes list and said to the SA “it smells kind of minty” so yeah it’s good to know its in there. I was always tempted by Infusion d’Iris since it is on the market. I like it a lot but I never grew to love it. Additionally there is the problem that I am an iris-addict and sometimes cannot smell the beautiful scent because it has been around my nose for too long. But it was different with Eau d’Iris because there is laurel and mint. I love laurel and was a little disappointed when Laurier-Reglisse (Aqua Allegoria series by Guerlain) disappeared so quickly from the shelves. The mint-note in Eau d`’Iris I noticed quite late. It was at home when I had already bought it. It is in the top notes and too delicate to smell it in a perfume shop with all the other stuff around. And the mint-note reminded me of Un Air de Samsara by Guerlain, an almost forgotten flanker. If it had not been written on the bottle I would never have thought that this scent had any connection to Samsara. But I never forgot the strange and unique mint-note and now it is back and that is great!